Need a mid afternoon pick-me-up or healthy breakfast on the go? 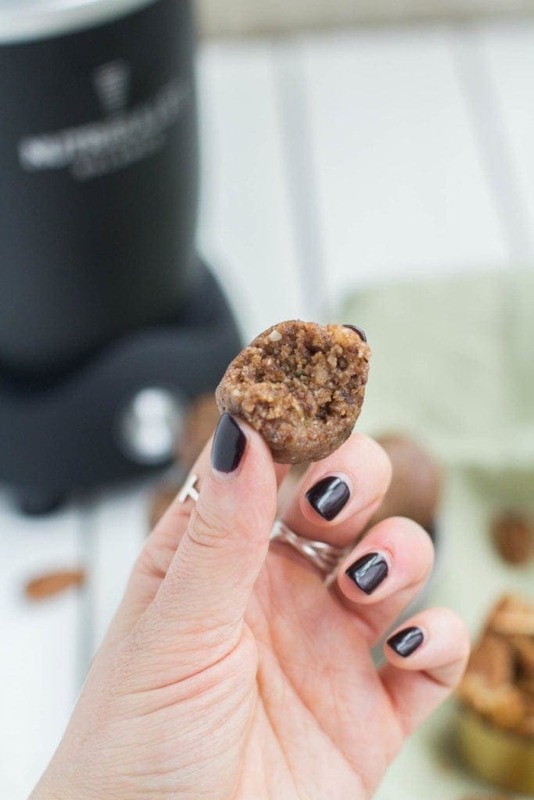 This Whole 30 Chocolate Coffee Energy Bites Recipe is perfect for meal prepping and having on hand! They’re dairy, gluten, grain and refined sugar free! This post is sponsored by NutriBullet Balance. I’m currently doing a Whole 30 and find myself missing my daily chocolate. I’m by no means a sugar addict – we rarely have dessert around the house (because I have zeeeero self control) and when given the choice – we usually opt for savory treats like yummy pizza, a cheeseboard, etc. But I do really love my dark chocolate. I like to buy high quality, super dark chocolate and enjoy a square mid afternoon. It’s just a little bit sweet + the perfect way to end the day. You’re probably thinking – well I don’t have the time or energy to make bites during the week, especially when it’s the middle of the day. But actually, if you have the right tools – you do! 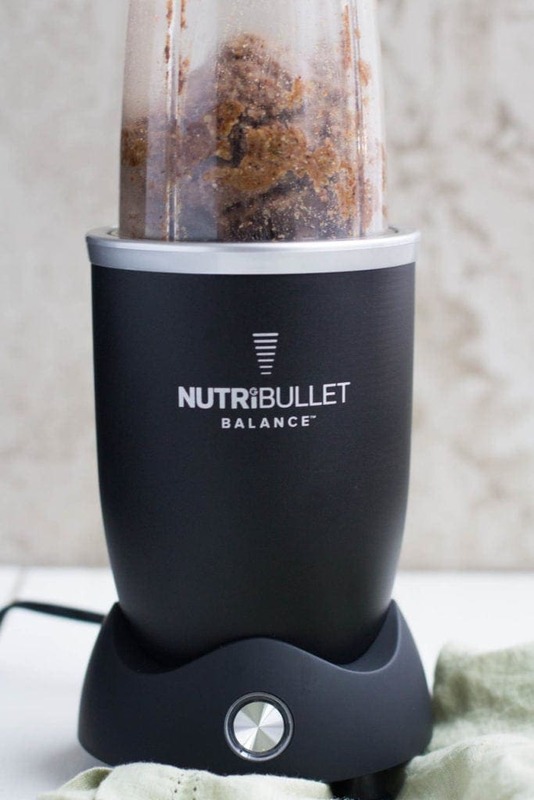 I have been a fan of NutriBullet products for pretty much forever, but I recently got to try out their NutriBullet Balance which is SO darn cool. While my old NutriBullet is amazing, I have totally fallen in love with this one. So many of you are always asking for nutrition facts for my recipes – so I used the NutriBullet Balance’s calculations to share them below for this one! In addition to being able to track all the nutrition facts on these little bites- the NutriBullet Balance was able to blend up the bites to a smooth consistency pretty quickly. No fussing around, scraping the edges and trying to mix things up evenly – this thing is POWERFUL and helped me get the perfect snack ready in no time! Need a mid afternoon pick-me-up or healthy breakfast on the go? 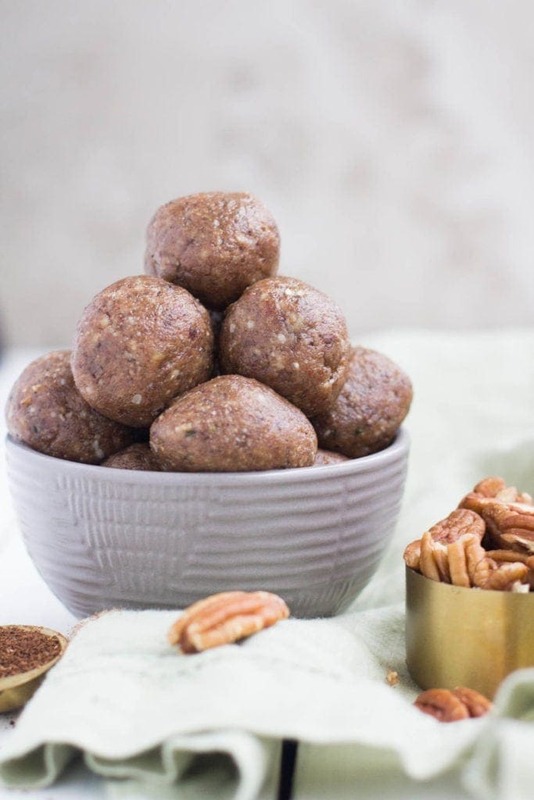 This Whole 30 Chocolate Coffee Energy Bites Recipe is perfect for meal prepping and having on hand! 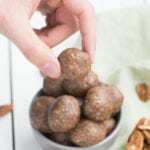 They're dairy, gluten, grain and refined sugar free! 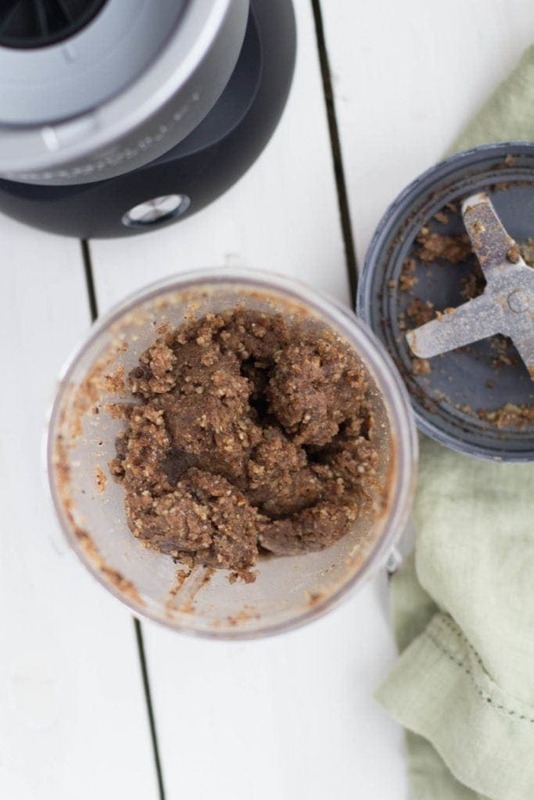 In your NutriBullet Balance pulse pecans until they are in fine pieces. Add hemp seeds, coffee, chocolate + coconut oil and blend until they are combined. 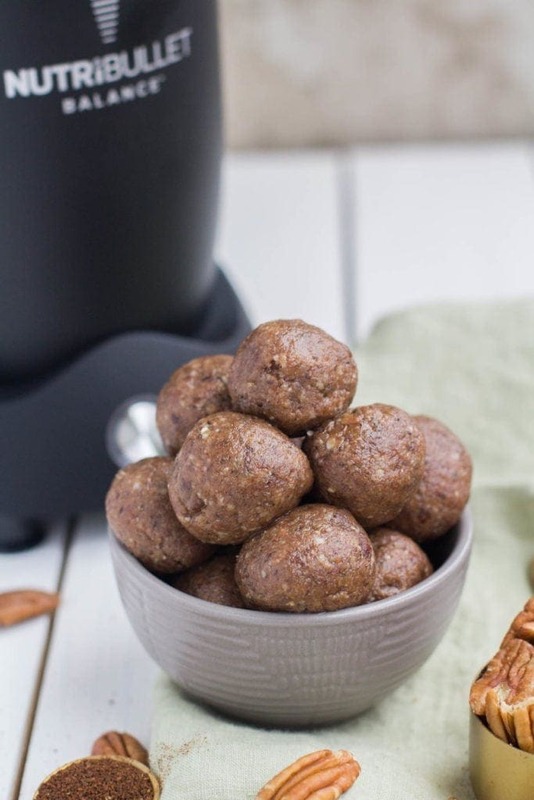 These Whole 30 Chocolate Coffee Energy Bites are perfect for meal prepping in advance. 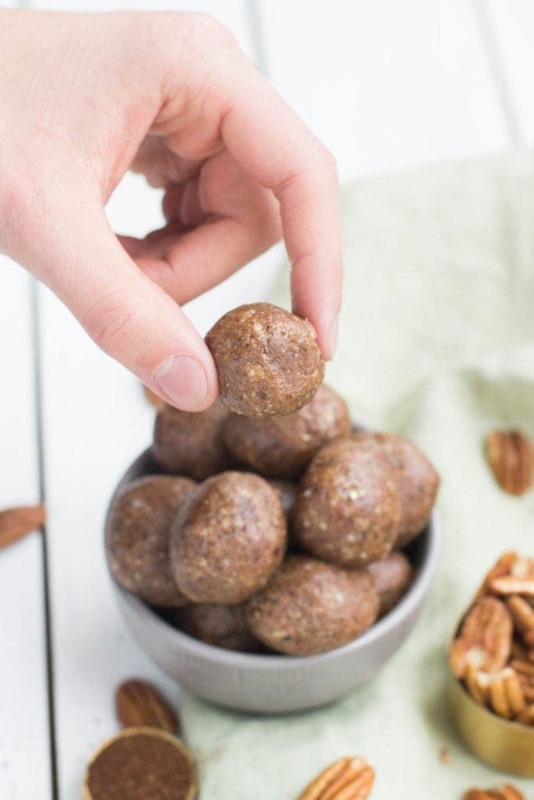 I love making them on Sunday night + just knowing that they’re in the fridge in case those sugar cravings kick in and fruit or tea won’t do the job. If you’re looking for something easy + yummy – these are the perfect treat! If you don’t have a NutriBullet Balance, I highly recommend them. I had my regular NutriBullet for over 4 years before upgrading to this one. They’re an amazing kitchen tool to have! I use it for so many things…smoothies, soups, energy bites + more – you can make pretty much anything in them! My kitchen would totally be lost without it. You can see the Nutrition Facts for this on My Fitness Pal. These look delicious, but I’m cringing a little bit at the “whole 30,” “afternoon slump,” “sugar craving” parts! One of the big things of Whole 30 is to try and retrain the way you view food. The goal is to eliminate the afternoon slump by feeding your body nourishing and healthy foods. While the ingredients are Whole 30 compliment, the idea that this beats a sugar craving is not very Whole 30. Not trying to sound like a pill, but am very passionate about adhering to the rules during the 30 days in order to see success! 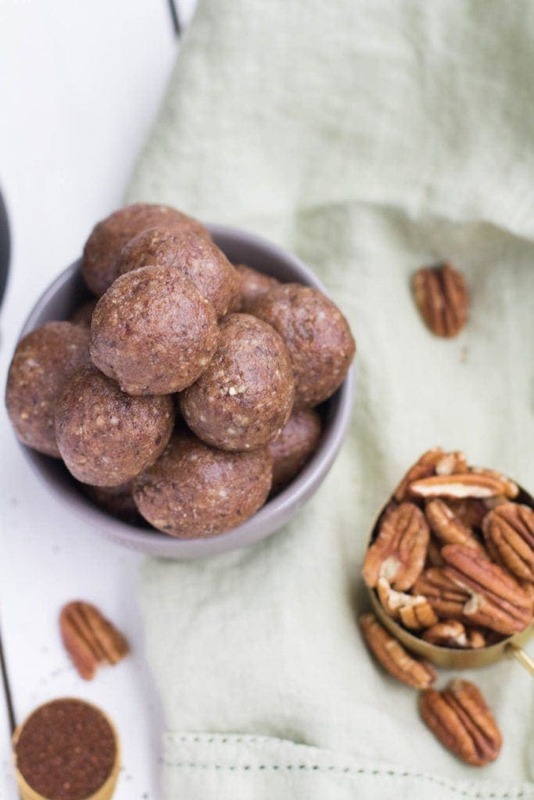 I will definitely be trying these when I’m finished with this round of whole 30! I totally understand what you’re saying! I wasn’t saying they weren’t healthy by any means! I think they sound delicious and would love to try them. I just personally wouldn’t recommend someone using these when actually completing a whole 30 by the books since one of the goals is to decrease sugar cravings. But definitely something I add in when I’m not doing a Whole 30! Tried these and loved them! So easy!